Shirataki Noodles, also referred to as Miracle Noodles, have zero calories, are gluten-free and low carb. They absorb delicious flavors very well, and can be substituted in many recipes that call for pasta — Sesame Chicken Shirataki Noodle Stir-Fry recipe is a perfect example! I’m just going to get right to it today. Melissa’s Produce sent me a bag of Shirataki Noodles to try. I had never had them before so I was super excited to work with them. 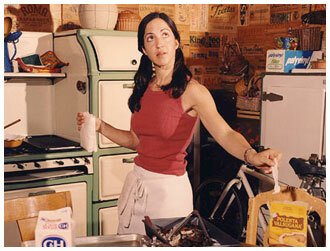 (You know how I get with new and interesting ingredients!) Well it turns out that these Shirataki noodles are quite good. Shirataki Noodles, made from a yam-like plant called Konnyaku or Konjac, are essentially calorie-free, with a fair amount of fiber and traces of calcium and iron. They’re incredibly versatile as they absorb other flavors that are added to them. Though similar to rice noodles, they are a bit heartier and have a slightly denser texture. 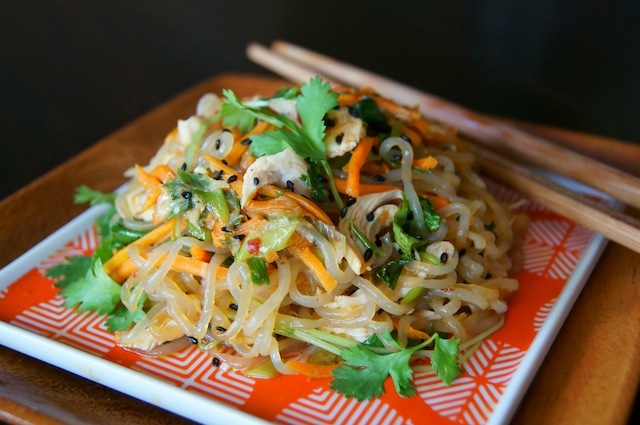 Shirataki Noodles are fantastic for gluten-free eaters. With all that going for them, it’s no wonder they are often branded as Miracle Noodles! While you can get Shirataki “Spaghetti” Noodles, and Shiratake “Fettucine” Noodles, don’t be fooled, they’re not one bit Italian — they’re a quintessential Japanese food. You can use them as you would Soba or Udon in soups and stir-fries, like this one. Just look how gorgeous those ingredients are! Sesame Chicken Shirataki Noodle Stir-Fry is quick and easy to prepare so it’s a perfect side or main course for a casual dinner party. Oooh, it would be so delicious tonight! 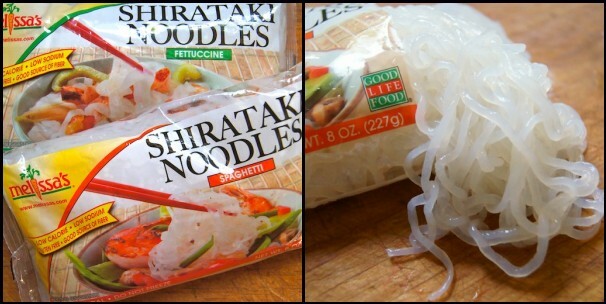 You can get more information about Shirataki Noodles (AKA Miracle Noodles) here. The Shirataki noodles absorb all of the delicious flavors in this recipe perfectly -- it can be served hot, warm or cold. Coat a medium-sized sauté pan with the oil and place it over medium heat. Add the carrots, pea sprouts, garlic and ginger and stir to combine. Sauté until the carrots are tender, about 5 minutes. Add the scallions, chicken and cilantro. Stir to combine and turn off the heat. In a tiny bowl, mix the soy sauce with the sesame oil, chile paste and sugar. Pour this over the noodles and then add them to the sauté pan. Turn the heat on to low, add the toasted sesame seeds and gently toss all of the ingredients together. Once everything is warm, after a couple of minutes, remove from the pan from the heat. Kikkoman makes gluten-free soy sauce. And most brands of Tamari are gluten-free and would work well here, too. OMG! Yum. This looks amazing! Valentina, this is a great dish, especially to take to the office for lunch. Valentina, your Sesame Chicken Shirataki Noodle Stir Fry recipe looks so awesome and delicious. I plan to try it this week and I would be using my favorite shirataki noodles, Miracle Noodles. They are a staple at our house, great variety in shapes, zero calories and carbs, no soy, gluten or sodium! Their Facebook page is so amazing with simple healthy recipes from all over the world! Thank you for your interesting site! Valentina- I love this kind of comforting Asian stir fry. I’m curious to try the pea shoots. Looks amazing. Even for those of us who aren’t gluten-free, this sounds like a perfec summer supper! I love that it will have a good bite from the sambal oelek! And a bit of sweet and a bit of sour. Total umami! Love how quick and easy your recipes are… so accessible to everyday folks but rates that make them seem so much more involved. Can’t wait to try this out for our potluck dinner with friends tonight. Yum! I just wanted to mention that pretty much all brands of soy sauce are not gluten free. There are gluten free alternative though, but they aren’t technically soy sauce. I can’t find pea shoots what should I do? Any substitutes or leave it out? Hi Diya, they are in season in the spring. you can add any green, really — I think thinly sliced spinach leaves would be nice. Or yes, you can also omit them. Hope you enjoy!